Sadly, the Leadbeater's Possum and Helmeted Honeyeater are considered to be endangered species (2007). Representatives of interested Victorian government departments, societies and individuals met on 18 September 1951 and unanimously agreed on Common Heath as the State floral emblem. 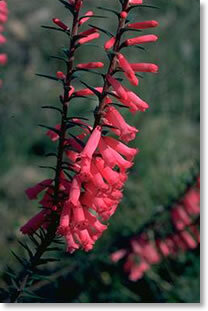 The pink form of Common Heath, Epacris impressa, was proclaimed the floral emblem of Victoria on 11 November 1958. Victoria was the first Australian State to give official recognition to such an emblem. Common Heath is a slender, upright shrub which grows to about a metre in height. The rigid, alternate leaves are stalkless and fairly narrow. They range from 4 to 16 mm in length and are sharply pointed. There are around 170 species of the honey eater variety recorded in Australia. As the name suggests, most from this variety are nectar feeding birds. However, nectar only makes up a small proportion of the Helmeted Honeyeater's diet. The Helmeted Honeyeater is endemic to Victoria, and is also the only bird species to be endemic to the state. 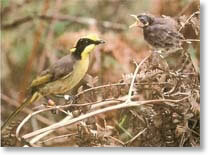 For this reason, the Helmeted Honeyeater became Victoria's bird emblem in 1971. 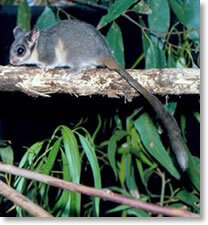 Leadbeater's possum is an endangered marsupial that can be found in the Central Highlands of Victoria. Prior to 1961, this animal was thought to be extinct. Leadbetter's possum is the official faunal emblem of Victoria State. The current decline of the species is due to a diminishing habitat caused by timber harvesting and fires. In 2003, the estimate total population of this species was 500 total animals. The average leadbeater's possum weighs in at 140g. Head and body measurements average 160mm, the tail also averages 160mm. The body and tail are grey. There is a black stripe extending from the forehead of the animal down the back where it fades intothe grey. A black stripe is also present on each cheek. The underbelly, neck, and part of the face are white. Pink is present on the nose, feet, and ears. 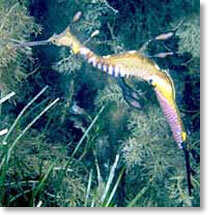 The Weedy Seadragon was selected as Victoria's official marine faunal emblem by public nomination and was proclaimed by the Governor in Council on 31 October 2002. The Weedy Seadragon represents the delicate and beautiful world found beneath the waters of Victoria's unique marine environment. Weedy Seadragons are beautifully coloured, dainty, timid animals that swim slowly and gracefully. They can grow up to 46 cm in length. Emblems have been associated with Olympic Games since 1932. The emblem of Melbourne 1956 Olympic Games shows a drawing of Australia, with a torch and Olympic rings superimposed. In the bottom half, the inscription "MELBOURNE 1956", extended on each side by laurel branches. Acacia leprosa 'Scarlet Blaze' is one of the most surprising and significant discoveries of twentieth century horticulture and was selected as Victoria's floral emblem for the Centenary of Federation celebrations. 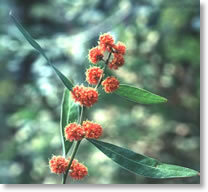 In 1995, bushwalkers in state forest north-east of Melbourne chanced upon a remarkable discovery - a single blood-red flower Cinnamon Wattle Acacia leprosa. Literally millions of wattles grow in the Australian bush and in parks and gardens across the country, but without exception they exhibit only yellow or cream flowers.